whether today’s Columbia is as welcoming to talented young architects as the Columbia of the 60s and 70s (see Tom Coale), whether these exercises in WWJRD (“What would Jim Rouse do”) are useful or not (see Jesse Newburn in her comments on Gehry’s letter), and how this might connect with the desire by members of the CA board to regain influence over the Inner Arbor Trust (see Bill “Marshmallow Man” Woodcock). However I want to step back a bit and look at a more fundamental question: Exactly what role does and should Symphony Woods play in Columbia, and what vision should guide its future? After reading Gehry’s letter I did some googling for “history of Symphony Woods”; one of the first results I found was a blog post on the subject that Bill Santos published over five years ago. At the time Bill was proposing that Symphony Woods wasn’t necessarily the old-growth forest that some people apparently talked it up as being, and might just have sprung up as new growth after a local sand and gravel operation shut down. After Bill said his piece an anonymous commenter took him to task in an extended treatise on the likely history of the area, with evidence brought in from geology, old US Army maps, aerial photography, and the like, all in an effort to prove that Symphony Woods had likely been a mature forest since at least the early to mid 19th century, and possibly quite longer. Franklin Township, NJ, ranked higher on Money Magazine’s list of small cities than Columbia, has succeeded in preserving a 500-acre old-growth virgin forest. Here we are now, finding it difficult to maintain just one small portion of ours, only 40 years ago designated as “permanent open space”, that designation not because those wild spaces were created just then at Columbia’s outset, but because they predated Columbia and were rightly recognized at the time as being an environmental asset worthy of preservation. I think we can do better. 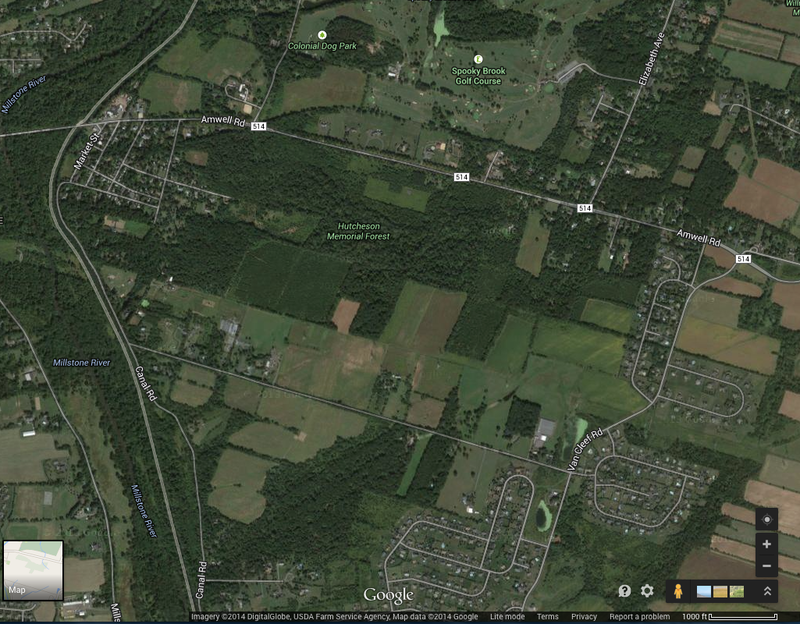 Satellite view of the Hutcheson Memorial Forest and surrounding area in Franklin Township NJ. Click for a higher-resolution version. The implication was that Columbia, unlike its “betters”, was in essence destroying its precious natural heritage in the name of “progress”. This story intrigued me. Although I’ve been through Franklin Township I’d never heard of the forest in question (the William L. Hutcheson Memorial Forest, to give it its full name), and I thought it was worth investigating. After all, maybe the anonymous commenter was right: Maybe in our haste to improve the Symphony Woods “experience” we in Howard County were and are throwing away our chance to preserve the last of an aeons-old forest. It turns out that the story is more interesting and nuanced than it might appear at first glance, and the lessons it holds for Columbia are not nearly as straightforward as one might think. First, consider the size of the forest. Bill’s anonymous commenter was somewhat misleading (or misled): The actual area of old-growth forest in Hutcheson Memorial Forest is only 65 acres, not 500, per the Wikipedia article he or she linked to; the rest of the 500 acres is a combination of new-growth forests, abandoned farmland, and fields used as test plots by Rutgers University. (See the Rutgers web site for more information.) The image I’ve included in this post (courtesy of Google Maps) is a satellite view of the area surrounding Hutcheson Memorial Forest. The total area in the image is almost four square miles or almost 2,500 acres. The 500 acre preserve is in the upper center of the image, below NJ 514 (Amwell Road), with the old growth forest comprising 65 acres in the midst of that. Beyond Hutcheson Forest proper is more open space, including a golf course and park north of Amwell Road. That’s important, because it gives the old-growth forest a buffer from encroaching development and means the entire forest has a better chance of being a sustainable ecosystem for the long term. 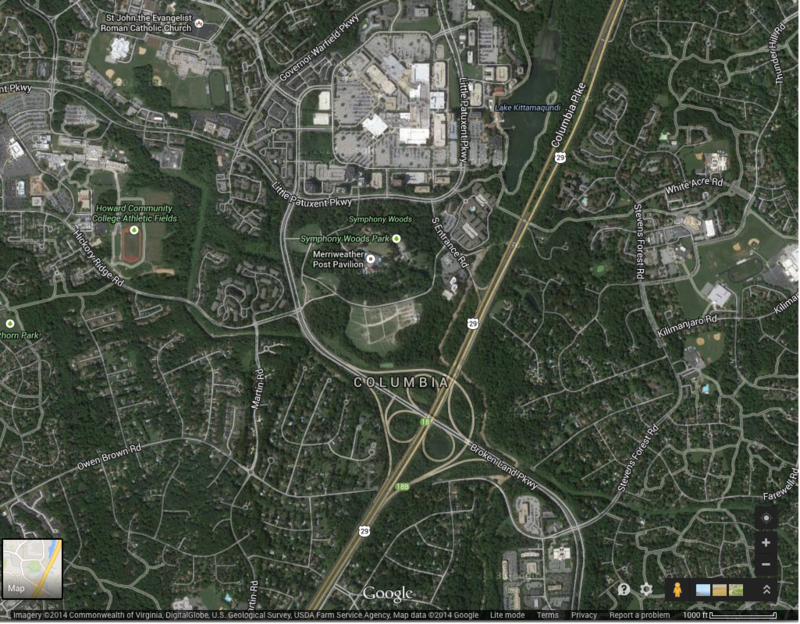 Satellite view of Symphony Woods and surrounding area in Columbia MD. Click for a higher-resolution version. Now let’s turn to a satellite view of Symphony Woods and its surrounding area, at the same scale and covering the same expanse, almost 2,500 acres. Looks a little different, doesn’t it? First, note that although the entire “Merriweather Park” area is over 46 acres, Merriweather Post Pavilion takes about 10 acres of that, so Symphony Woods itself covers only about 36 acres—a bit more than half the area of the core old-growth forest in Hutcheson Memorial Forest. And of course Symphony Woods has no new-growth forest, farmland, or other open space as a buffer—it’s right up against a four-lane highway, four-lane local streets, mid-rise office towers, and a regional mall. From that perspective pointing to Hutcheson Memorial Forest for inspiration is highly misleading; if Symphony Woods was indeed a thriving primeval forest and sustainable ecosystem then it was doomed from the moment Jim Rouse put shovel to earth at Columbia’s founding. But maybe it’s not too late. Maybe there’s a possible vision for the future of Symphony Woods that takes seriously the rhetoric about it being a precious natural asset, an ancient forest and oasis of calm in the heart of Columbia that should be preserved in a pristine state and not sullied by “out-of-scale ‘attractions’” (to quote Gehry). If so then arguably the first element of that vision should be eliminating the largest and most out-of-scale ‘attraction’, namely Merriweather Post Pavilion itself. Perhaps the original intent of the pavilion was justifiable, as a place to host classical music and dance performances for relatively small and well-behaved audiences in a beautiful wooded setting. But now that Merriweather Post Pavilion is wholly given over to popular music, what justification remains? I doubt they’d let even local heroes like Bruce Springsteen or Bon Jovi hold concerts in the middle of the Hutcheson Memorial Forest, so why should we allow Symphony Woods to be polluted by the presence of random rockers and rappers and their rowdy and often inebriated fans? Surely it would be better to demolish the Merriweather Post Pavilion structure, remove all outbuildings, fences, roads, and other intrusions, and let that area slowly return to its natural state, broken only by the occasional dirt or gravel path. Next, if we follow this logic then we should immediately discontinue Wine in the Woods and prohibit any other large-scale events on the Symphony Woods and the (by now former) Merriweather Post Pavilion properties. How can we justify the potential for damage inherent in packing thousands of people into a few acres of fragile forest ecosystem? The woods should be for a few wanderers in nature, not for the teeming masses. Finally, in this vision we scrap the development plans for downtown Columbia, most notably the Howard Hughes proposals for the Crescent area immediately to the south of Symphony Woods. We then consider taking any public or private funding that might go to the estimated $30 million cost of the Inner Arbor plan and purchasing as much of that land as possible from the Howard Hughes Corporation, to be incorporated into a new Symphony Woods nature preserve. There’s not enough land in the area to create a 500-acre park, but we could at least provide a bit of buffer to protect the woods from the surrounding suburban and semi-urban development. This is a radical vision to be sure, but it can be justified as the natural conclusion of viewing the eternal preservation of Symphony Woods in a pristine state as the first and foremost priority when considering its future. So there we have it: two very different visions for the future of Symphony Woods. The second vision is the one previously adopted by the Columbia Association, supported by Howard County government and local political, business, and culutral leaders, and now being implemented by the Inner Arbor Trust with the help of a team of talented designers. The first vision has no one willing to advocate for it, even among those opponents of the Inner Arbor plan who cast themselves as the champions of Symphony Woods. Why is that? I don’t profess to know the hearts of Inner Arbor opponents, but it may simply be that they believe that the original Columbia plan for Symphony Woods and environs was the true and correct one, and that any deviations from it are a violation of the Columbia vision. Or to put it less charitably: Since Jim Rouse saw fit to put a 15,000-person amphitheater and grounds in the middle of a mature forest, it’s OK. Since Jim Rouse (or one of his disciples) didn’t propose the Inner Arbor plan, it’s not OK. They have a perfect right to take that attitude, but at this point I have my own right to conclude that it doesn’t have all that much to do with preserving the environmental integrity of Symphony Woods, or for that matter the core question of what vision for Symphony Woods is best for Columbia’s future, as opposed to its past.